Needless to say, you should invest in real estate, whether it's through rental properties or REITs. We believe that the risk-to-reward is much stronger for REITs, especially once you take into account the hassle of managing rentals. We present a practical case study of how our REIT investment strategy aims to produce high returns without all the hassle that comes with rental properties. What’s your idea of a perfect investment? That’s a tricky question, but those looking for above average current income, along with reasonably good price appreciation prospects over time – and with only modest risk – will certainly want to consider apartment communities, office and industrial buildings, shopping centers, and other similar real estate investments. We think that this article can help you decide. For us, there's no doubt: REITs are much better vehicles for long-term real estate investing. Below we present why and explain how we seek high income opportunities with REITs, without all the hassle that comes with owning rental properties. First off, let me start by saying that I do not take this topic lightly. I have literally spent years studying it to determine which one is the better approach, combining practical experience in the private equity field and academic research at two universities. This argument is the most difficult one for rental investors to accept. 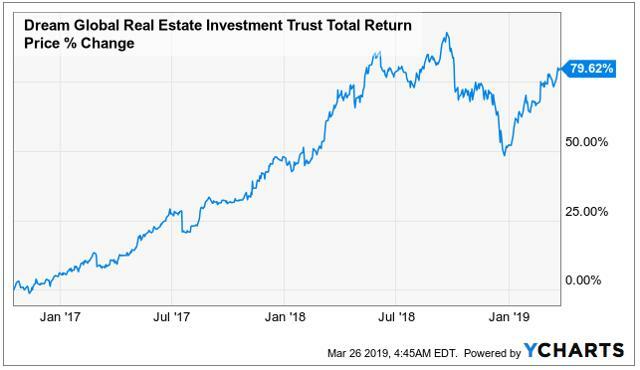 Rental investors will argue that REITs cannot outperform because of higher overhead cost, overpaying for assets, and no leverage benefit. Efficiencies in Management: REITs may own billions worth of properties, and this results in economies in scale at many levels, including interest expenses, property management and brokerage. Consider a private investor walking into a bank to ask for a loan vs. a $10 billion REIT walking into the same bank. Who is likely to get the best terms on their financing? 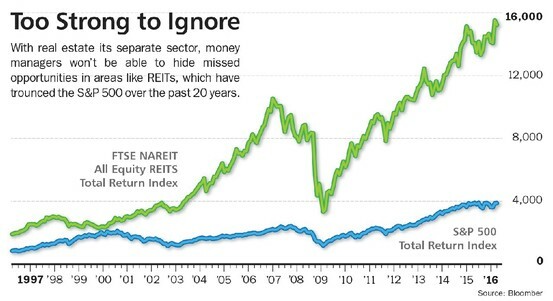 The superior efficiency of REITs can be massive. Some studies find that REITs have up to 4% head start per year from cost savings alone compared to other direct property investments. Higher Growth: Rental investors are limited to raising rents to grow NOI. REITs have many more opportunities to boost growth beyond rent increases. 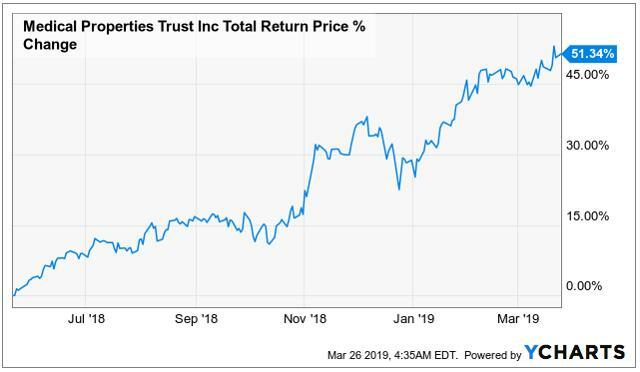 The most common way for REITs to increase growth rates is by issuing new shares, raising new debt, and investing these proceeds in new acquisitions. 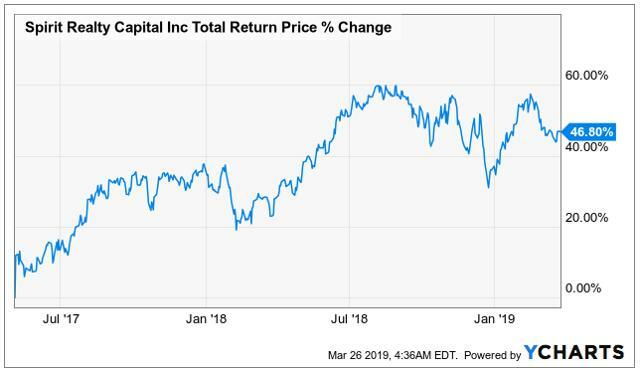 As long as the average cost of capital is lower than the expected return of the property, there's a positive spread to be earned for the existing REIT shareholders. 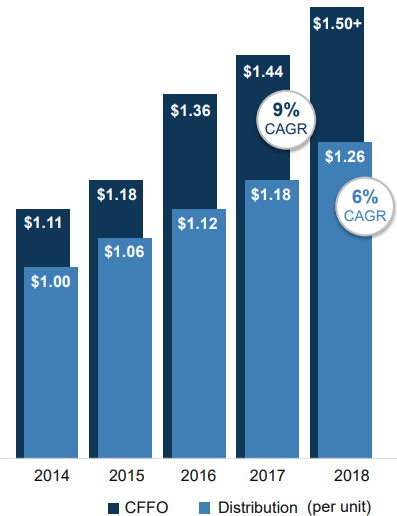 Higher growth results in greater income and share price appreciation in the long run. Can someone earn a higher return than REITs by investing in rentals? Yes, of course. But so can an active REIT investor earn higher than average returns by performing intelligent due diligence and investing in only undervalued REITs. 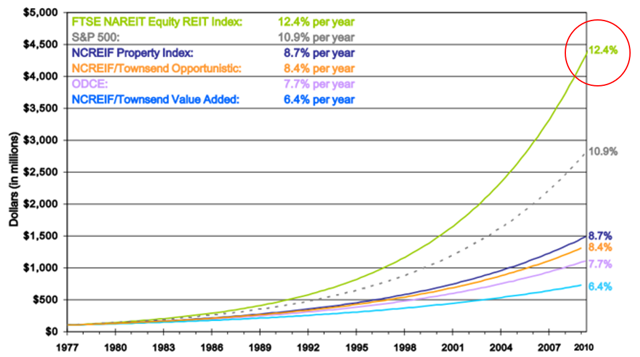 The best REIT investors have reached up to 22% annual returns for decades. The main takeaway here is that for the "average" investor who works a full-time job and has limited resources; REITs are likely to produce greater total returns over time than rental properties. This is especially true if you take into account the cost of all the extra hours of work you must put into rentals. If rental investors did the calculation, they would find that very often, their investments are subpar at best, and not worthwhile at worst. You want real estate working for you, and not you working for real estate. REITs clearly fit in the former. They are liquid, professionally managed, and you receive a consistent dividend check from your property investment every quarter. It's totally passive. Rentals, on the other hand, require a lot of work, effort, and constant worrying. They will often get closer to operating a business than a passive investment, and still then, the long-term results of these additional efforts are very uncertain. REITs can be freely traded on liquid markets at minimal transaction cost. In comparison, buying and selling rental properties is very costly and time consuming due to the risk of illiquidity. It's common to pay somewhere between 5%-10% of the purchase price in different fees and transaction costs when buying and/or selling a property. It dilutes returns considerably for the investors who are essentially losing up to 10% on day one in fees alone when making an investment. In comparison, REITs already have paid transaction costs and own a portfolio in which you can invest by buying shares, saving the real underlying cost of real estate transactions. REITs offer the opportunity to invest in broad and widely diversified portfolios of properties in a liquid and cost-efficient manner. With REITs, you can easily invest in all property sectors including office, retail, industrial, residential and many other specialty sectors in almost all geographical location. It results in significant risk mitigation as compared to private investments, which are likely to be much more concentrated in nature. Being concentrated can sometimes lead to higher returns, but it's also a much riskier strategy that has not historically paid off. Rental investors will often have to deal with personal liability issues and are at risk of getting sued by tenants, contractors, brokers, and others. Moreover, they may have to sign on loans with their name and be liable for everything. Structuring your investment as an LLC won’t always remove personal liability. With REITs, you are the shareholder of a publicly-listed company. Therefore, you have no personal liability and you cannot lose more than what you invest. Just 10 years ago, 1000s of rental investors were filling for bankruptcy due to over-leverage. Yet, most investors ignore the risk of personal liability. I have found that unless you have had to deal with liability issues in the past, you won’t appreciate this argument to its fullest. They will generate higher total returns over time for most investors. They provide truly passive income. You enjoy liquidity and low transaction cost. You can easily diversify to mitigate risks and improve risk-adjusted returns. You have no personal liability. Higher returns, lower risk, and significantly less work: This should be the conclusion for most investors. To illustrate the above, let us dive into a practical example of how our REIT investment strategy compares to rental investments. We will here assume that the rental property is located in an average market, not an expensive one like San Francisco, but not cheap like Detroit either. On the REIT side, we will outline the typical REIT that we target at High Yield Landlord. In this case, we use as an example our late December investment in Brookfield Property REIT (BPR) – a +$17 billion property empire. The rental investment produces a high cash on cash return. The cash flow is initially higher than the REIT thanks to greater leverage and saving the cost of management by taking care of everything yourself. Moreover, in the long run, your cash flow (and appreciation) is unlikely to be as high as for a well-managed REIT. This higher growth compensates for the slightly lower immediate income and results in greater total returns in the long run. Moreover, your investment is liquid, diversified, invested in Class A assets, and professionally managed. Your immediate income is lower because the REIT retains some cash flow for future growth and has to pay for some overhead cost (passive for you). This is where our secret sauce of our strategy comes into play: Our REIT investment (BPR) was done at a 50% discount to the private market value of the underlying properties. We managed to get this large discount by investing during the late December sell-off which was way overdone. REITs have historically traded at a slight premium to NAV to account for the benefits of liquidity, diversification and professional management. Assuming it takes five years on average for this gap between price and value to close, we get an additional ~8% annualized return, pushing our expected annual total return closer to 15%-20% per year. In reality, our investment has performed even better because the market was quick to recognize that the discount to NAV was excessive. The shares have returned close to 40% since making our investment three months ago. To be perfectly clear, it rarely works out so well, and we occasionally even suffer losses (see disappointing investments in CBL or UNIT). But with a diversified portfolio of deeply undervalued REITs, the results will most often surpass those of rental properties from our experience. 2017 example: Spirit Realty Capital (SRC) crashed in May of 2017 after disappointing quarterly earnings. We recognized an opportunity to buy quality net lease assets at an estimated 30% discount to NAV. Total returns are approaching 50% in a less than two year holding period – from low risk assets. Active REIT investors who target REITs at discounts to NAV have managed to reach up to +22% annual returns over the past decades. This is what we aim to do at “High Yield Landlord” by specializing in value REIT investing. Right now, our portfolio trades at an estimated 21% discount to NAV on average and pays a close to an 8% dividend yield. We believe that most investors buy rentals (instead of REITs) because they do not know enough about REITs to recognize that they are better investments in most cases. With our "Rental vs. REIT" comparisons on Seeking Alpha, we aim to educate investors on the power of REIT investing. 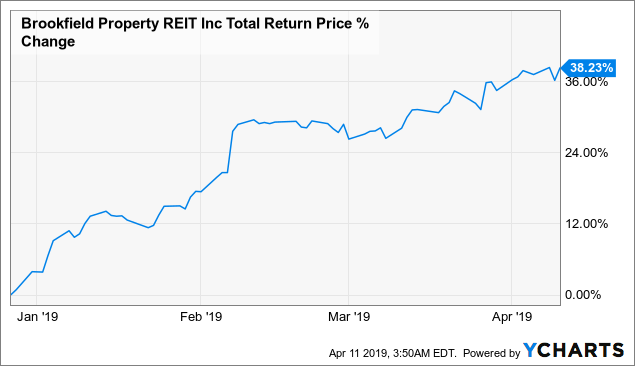 I have myself been a professional real estate investor in the past, but once I learned more about REITs, it became obvious that it's a more efficient way for the average investor to invest in real estate. Today, I have become a professional REIT investor and I aim to buy REITs at less than what they are worth in order to achieve high income and capital appreciation. It's just common sense that such strategy, when implemented correctly, can lead to fantastic investment results. This is not, however, possible for everyone. I do this full time, it's my only focus, I have great resources, and access to management teams to conduct interviews. I spend 1000s of hours and well over $20,000 per year researching the market to identify the best ~20 opportunities in a universe of over 200 REIT opportunities. The objective of High Yield Landlord is to streamline this research process and allow interested members to emulate our strategy at a tiny fraction of the cost. We are already +350 members. Join us today and Save $100! Disclosure: I am/we are long BPR; MPW; SRC; UNIT; CBL-E. I wrote this article myself, and it expresses my own opinions. I am not receiving compensation for it (other than from Seeking Alpha). I have no business relationship with any company whose stock is mentioned in this article.